The Convert: A Tale of Exile and Extremism. By Deborah Baker. Graywolf, 246 pp., $23. Deborah Baker purports in this book to tell the story of an American woman who converted from Judaism to Islam in her 20s and who, after moving to Pakistan in 1962, has remained there. But she gives you reason to distrust most of The Convert by waiting until late in book to clarify a line on the dust jacket that says that she drew on letters that Maryam Jameelah sent home to her parents after she had begun her new life as Maryam Jameelah. That note does little to bolster the credibility of The Convert, given that doctors said Jameelah had schizophrenia and that she appears to be mentally disturbed, whether or not the diagnosis was accurate. There may well be a fascinating story in the life of the former Margaret Marcus of Mamaroneck, New York, but Baker hasn’t found a credible way to tell it. Published: 2011 (Graywolf hardcover). Graywolf paperback due out in September 2012. Flap copy: The dust jacket of the hardcover edition of The Convert erroneously says that Jameelah grew up Larchmont, NY, when the book makes clear that it was Mamaroneck, a mistake picked up by many reviewers. Janice Harayda has been the book columnist for Glamour, the book editor of the Plain Dealer, and a vice-president of the National Book Critics Circle. One-Minute Book Reviews is ranked one of the top 40 book blogs by Technorati and top 40 book-review blogs by Alexa Internet and was named one of New Jersey’s best blogs by New Jersey Monthly. You can follow Jan (@janiceharayda) on Twitter by clicking on the “Follow” button in the sidebar at right. © 2011 Janice Harayda. All rights reserved. Have a Little Faith: A True Story. By Mitch Albom. Hyperion, 254 pp., $23.99. In his bestselling Tuesdays With Morrie and the new Have a Little Faith, Albom assumes the posture of an innocent who became a man of the world without having learned the basic lessons that Fulghum seems to have picked up between games of dodgeball. He is not, it appears, a quick study. Albom said in Tuesdays With Morrie that during his talks with a dying former professor, he learned that “love is how you stay alive, even after you are gone.” He writes in his new book that he has learned fresh lessons — about what he calls “faith” — from Albert Lewis, the New Jersey rabbi who presided over his bar mitzvah in 1971, and a pastor to the homeless in Detroit. Lewis told Albom that whenever he looked at a picture of the family he loves, he thought, “This is your immortality.” But if love keeps you alive – at least in others’ hearts – isn’t that what Albom learned from Morrie Schwartz? No discovery seems too basic for Albom not to cast as a revelation as he and Lewis talk about cosmic and earthly questions: What makes people happy? Why does it mean to be good? How can you cope with tragedy? Albom is amazed when Lewis asks a Hindu health aide about her belief in reincarnation. “How can you – a cleric – be so open-minded?” he asks, as though shocked that the rabbi isn’t a bigot. The news that his old synagogue has extensive files on its history seems to fill him with wonder. “I didn’t know there were files,” he tells the woman who informed him of it. Imagine: A synagogue that keeps good records! Under the rubric of “faith” Albom writes about religion in such a generalized feel-good way that you’re not sure how his view differs from the God-is-love school of theology or even New Age psychobabble. You wonder if he knows. Albom says he wrote Have a Little Faith “in the hope that all faiths can find something universal in the story,” and it’s full of pseudoprofundities such as, “we all want the same things: comfort, love, and a peaceful heart.” But the view of “immortality” that he seems to advocate – that you find your afterlife in the memories of others – is far more Jewish than Christian (not to mention, Hindu, Buddhist, or Muslim). Certainly few Christians would disagree that people “live on” in others’ minds. But Christian theology holds that things like “comfort, love and a peaceful heart” are not the ultimate aim. They are the byproducts of a larger goal, which is salvation through Christ. Albom tries to keep the book from tilting toward his religion by interweaving chapters about his old rabbi with sections on Henry Covington, an ex-drug dealer who began a ministry to the homeless after a spiritual plea bargain: One night when he thought killers were trailing him, he decided that if he survived, he would devote his life to Jesus. But in these sections Albom keeps his distance from theology and focuses on matters such as whether the pastor’s church can keep the lights on, so the spiritual heart of the story lies in Lewis, who set the book in motion by asking his former congregant to give his eulogy. Like Albom’s recent novel For One More Day, his new book is written at third-grade reading level, according to readability statistics that are part of the spell-checker on Microsoft Word. * Have a Little Faith is more interesting than that homespun parable in because Lewis is a bit of card – he kept a mock parking sign in his office that said, YOU TAKA MY SPACE / I BREAKA YOUR FACE — and the book has excerpts from his sermons. It also includes the fine eulogy Albom eventually gave for Lewis that may inspire you if you have to give a similar talk. Otherwise, you are well-advised keep in mind something Albom says he learned while writing this book: He is “neither smarter nor better” than others, just luckier. Worst line: No. 1: “January arrived and the calendar changed. It was 2008. Before the year was done, there would be a new U.S. President, an economic earthquake, a sinkhole of confidence, and tens of millions unemployed or without homes. Storm clouds were gathering.” Yes, when January arrives, the calendar usually does change. No. 2: “What do you do when you lose a loved one too quickly? When you have no time to prepare before, suddenly, that soul is gone? “Ironically, the man who could best answer that question was sitting in front of me.” This is a misuse of “ironically.” Nothing “ironic” is happening here. About the reading level of this book: To figure the reading level of Have a Little Faith, I entered into a computer the full text of pages 24–25, 124–125, 224–225 and pages 164–165, then ran the spell-checker on Microsoft Word, which shows you the Flesch-Kincaid reading level at the bottom of the stats window. The reading levels for the pages averaged Grade 3. 7 and ranged from a low of Grade 2.8 to a high of Grade 6.5. The passages entered include only words written by Albom, none by Lewis. A comparison of Albom’s level and that of other authors appears here. You can also follow Jan Harayda on Twitter at www.twitter.com/janiceharayda. (c) 2009 Janice Harayda. All rights reserved. Mitch Albom gets religion in Have a Little Faith, a memoir of his encounters with his childhood rabbi in New Jersey and a pastor he met as an adult in Detroit. Albom was a finalist in the annual Delete Key Awards competition for bad writing in books for his novel For One More Day, written at a third-grade reading level according to the readability statistics that come with the spell-checker on Microsoft Word. Is his new book better? A review of Have a Little Faith will appear this week on One-Minute Book Reviews. You can also follow Jan Harayda on Twitter www.twitter.com/janiceharayda. 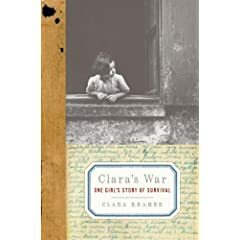 Clara’s War: One Girl’s Story of Survival. By Clara Kramer. With Stephen Glantz. Harper/Ecco, 339 pp., $25.99. This first quote comes from the story told in Clara’s War with the aid of screenwriter Stephen Glantz. The second comes from one of its excerpts from the teenage diary said to have inspired the narrative. The inconsistency between the two quotes – one of a number involving substantive facts – shows a problem with this book: Its publisher bills it as a “biography,” but it reads more like a novelization of a life. As Clara’s War has it, five thousand Jews lived in Zolkiew, Poland, at the start of World War II, and about 50 survived. Clara Kramer was one of the lucky ones. She survived the Holocaust because an ethnic German named Valentin Beck hid her family and others for more than a year in a bunker under his house, “a space no larger than a horse stall.” Beck had a reputation as an anti-Semite, a drunk and a philanderer, and he appears to have had complex reasons, not all of them noble, for sheltering Jews during the Nazi occupation of Zolkiew. He often summoned one of the women in the bunker to his living quarters for trysts, and the affair may have begun before she arrived. His infidelity enraged his wife and, when it came to light, imperiled everyone under his roof. If Clara’s War is accurate, the Becks were nonethess heroic, saving 18 Jews, and have been honored by Yad Vashem, Israel’s official Holocaust memorial. Valentin’s acts of kindness included bringing the teenage Clara composition books and a blue pencil that she used to keep a diary, now in the U.S. Holocaust Memorial Museum. But it is hard to know how accurate the book is. With Glantz’s help, Kramer describes many scenes in a detail few people could recall even with the help of a diary, such as line-by-line conversations complete with gestures and facial expressions. Some events serve literary purposes that seem too neat. One occurs in the prologue when the author is 12 years old and her sister leaves the shelter of an apple tree to look at bombers overhead – a foreshadowing of a disaster that will occur later. You never really see how 18 people could have survived in a crypt-like space the size of “a horse stall,” though the book has a diagram and says that the bunker still exists and the author and others have returned to it. Kramer kept in touch with others saved by the Becks, and they and their descendants presumably have confirmed much of the story in Clara’s War. Even so, you wish the book had fewer inconsistencies and cinematic flourishes. The excerpts from the diary in the Holocaust Museum are fascinating in their own right, and you hope that readers someday will have a chance to read the entire journal in straight-up form. Worst line: “My father’s family was so religious that they had had considered it irrelevant to have their weddings recorded by the state. So even though we went by the name of Schwartz in our day-to-day life, all of our official papers, including my birth certificate, bore the name of Gottlieb.” Why Gottlieb? Was Gottlieb carried over from previous generations not mentioned in the book? Or did ultra-religious Jews choose it because it means “God love”? Published: 2009 (first American edition), 2008 (British edition from Ebury Press, part of Random House). Watch a video of Clara Kramer talking about the Holocaust and her book. Consider reading instead of or in addition to Clara’s War: All But My Life, a beautifully written memoir by Gerda Weissmann Klein and a pillar of Holocaust literature. © Janice Harayda. All rights reserved. Good Christmas poems are easy to find (starting with the standard-bearer, “A Visit from St. Nicholas,” which is out of copyright and readily available for free on sites like Bartleby www.bartleby.com/248/27.html). But good Hanukkah poems are harder to track down. One of the best I’ve found for children of varied ages — from preschoolers through about 8th grade — is Aileen Fisher’s “Light the Festive Candles,” which appears in The Random House Book of Poetry for Children (Random House, 248 pp., $22.99), selected by Jack Prelutsky and illustrated Arnold Lobel. Fisher explains how and why Jews light the menorah in the poem, which begins: “Light the first of eight tonight — / The farthest candle to the right.” The poem has the strong rhymes, clear language and relatively short lines that children ages 9 and under typically prefer. 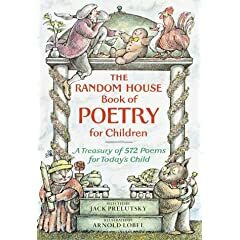 The Random House Book of Poetry for Children has more than 500 new and classic poems for children, including the full text of “A Visit From St. Nicholas” and other good Christmas poems. First published 25 years ago, this is one of the best all-around poetry collections for children that is widely available in stores and from online booksellers I picked up a copy last week in the children’s-poetry section of a large Barnes & Noble. If you’re looking for a good collection for young children, go thou and do likewise. Did you look at the lists of the bookies’ favorites for the 2008 Nobel Prize in literature and think, “There’s no way Philip Roth or Amos Oz is going to get the award this year”? I did for an obvious reason: The Swedish Academy said it was going to announce the winner on Yom Kippur. And I couldn’t believe the Academy would be so religiously tone-deaf as to ask a Jewish writer to take a call from the judges — and face the ensuing media onslaught — on a high holy day. The judges would have looked like cretins even if the winner had been too overjoyed to object. In naming the day of the prize, the Academy all but told Roth and Oz to forget it. The question is: Why did the Academy decide to announce the winner on Yom Kippur in the first place? To my knowledge no important literary prizes are awarded on major religious holidays. That timing may reflect a literary reality as much as a respect for people’s spirituality: Writers get so few prizes that they deserve to be able enjoy them when they do. To much of the world, the Nobel Prize in literature represents high culture and Hollywood stands for low. But even the Academy Awards presenters don’t hand out the Oscars on Easter. By deciding to award the literature prize on Yom Kippur, the Swedish Academy has made Hollywood look like a pillar of good taste. “Many years ago in parts of Europe there was a custom at Rosh Hashanah, the Jewish New Year, which could expand our present-day ideas about giving. “A village elder went from house to house with a bag full of coins. Those who could afford to contribute put coins in the bag; those who were poor and needed help took coins out of the bag. No distinction was made between those who put in and those who took out. This practice insured that no one in the community suffered, and it was done in a manner that maintained the dignity of all. St. James suggests adapting this tradition by donating blood, arranging to have fresh fruits or vegetables delivered to someone every month for a year, or giving a gift certificate for car repair, home maintenance, or another service a financially strapped family might not be able to afford. She offers more ideas like these in Simplify Your Christmas. The Book of Dahlia: A Novel. By Elisa Albert. Free Press, 276 pp., $23. There is nothing noble – or so it might seem — about the anti-heroine of Elisa Albert’s first novel, a 29-year-old unemployed stoner who lives in a bungalow in Venice, California, bought for her by her well-off father. Dahlia describes herself, with only slight comic exaggeration, as “vile, self-absorbed, depressing, lazy, messy, spoiled” and “probably mentally ill.” She is also sexually irresponsible and relentlessly profane. But Dahlia has perfect pitch for the absurdity – and cruelty — of much of the advice inflicted on cancer patients. The propaganda is exemplified by It’s Up to You: The Cancer To-Do List, a guilt-inducing advice manual that she got soon after her diagnosis. If you don’t get better, it suggests, it’s because you’re not trying hard enough to show “positivity” or find the “bright side.” (Bad luck, apparently, has nothing to do with it.) Each chapter in The Book of Dahlia takes its title from one in It’s Up to You and satirizes a psychological cliché — “Reframe,” “Heal Yourself,” “Find a Support System” – often with merciless accuracy. All of this is more interesting than the parallel story of how Dahlia became such a slacker. That tale begins with her parents’ courtship on a kibbutz. And involves somewhat predictable explanations — cruel mother, callow older brother, kind but ineffectual father – that emerge as Dahlia undergoes radiation, chemotherapy and more. But if The Book of Dahlia has less unity How This Night Is Different, Albert’s wonderful collection of short stories, it also has higher ambitions. Young writers typically find humor in safe topics, such as designer shoes or clueless bosses. Few have the courage to take aim at larger – or worthier — targets than Albert does in this book. Worst line: Albert could tighten her grip on point on view. Most of her story is told from Dahlia’s point of view. But at times the story goes inside the heads of others, such as Dahlia’s father: “Bruce ached for his daughter’s lack of a mother, and had tried to do everything in his power to distract her.” You could argue that at such times, Dahlia has internalized her father’s point of view so that it’s now hers. But because we don’t know if how she has internalized it, the lines are distracting. Furthermore: Albert also wrote the short story collection, How This Night Is Different www.oneminutebookreviews.wordpress.com/2006/11/22/. One-Minute Book Reviews is for people who like to read but dislike hype and review inflation. Janice Harayda has been the book columnist for Glamour, book editor of The Plain Dealer in Cleveland, Ohio, and a vice-president of the National Book Critics Circle www.bookcritics.org. (c) 2008 Janice Harayda. All rights reserved. For a holiday that Jewish scholars regard as minor, Hanukkah has produced at least one major children’s book and others that shine like a just-polished silver menorah. The best is the Caldecott Honor Book Hershel and the Hanukkah Goblins (Holiday House, $6.95, paperback, ages 4–8). Eric A. Kimmel’s spirited text finds its inspiration in exploits of Hershel of Ostropol, a quick-witted, itinerant Jewish folk hero who lived Eastern Europe in early 19th century. 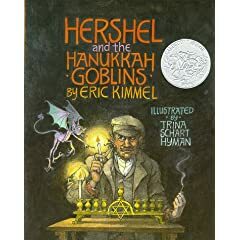 In this picture book Hershel must outsmart goblins who haunt an old hilltop synagogue and annually spoil Hanukkah in the valley below though tactics such as blowing out villagers’ candles and throwing their latkes on the floor. He triumphs through an ingenious mix of humor, intelligence and feigned indifference to their powers. (When the king of the goblins tries to intimidate Hershel by asking him if he knows who he is, he quips, “I know you’re not Queen Esther.”) The entertaining text is not flawless: A seam shows where Kimmel seems to have edited out the stories of a few goblins who appeared in longer version. But Trina Schart Hyman’s pictures have their usual rich, luminous beauty – like that of fine stained glass windows – and lift Hershel and the Hanukkah Goblins into an aptly ethereal realm. Schart Hyman is one of few picture-book artists can make dark tones rest as lightly on their pages as Tomi Ungerer’s did his great Moon Man. Kimmel www.ericakimmel.com has also written at least a half dozen other widely respected picture books about Hannukah. One that’s out-of-print but worth tracking down at a library or elsewhere is The Magic Dreidels (Holiday House, $6.95 paperback, ages 4–8), illustrated by Katya Krenina, the engaging story of a boy named Jacob who encounters a goblin who gives him several magic dreidels, the four-sided tops that children spin during Hanukkah. A picture book that is in print Kimmel’s The Chanukkah Guest (Holiday House, $6.95 paperback, ages 4–8), a folk-tale–like story of an old woman with failing vision who lives on the edge of a forest and serves her Hanukkah latkes to a bear she mistakes for her rabbi. First published in Cricket, The Chanukkah Guest www.holidayhouse.com isn’t in the same league with Hershel and the Hanukkah Goblins or even The Magic Dreidels. But it tells an amusing story about a friendly bear that’s likely to appeal to 4- and 5-year-olds who enjoy tales such Hansel and Gretel and Little Red Riding Hood. Another picture book that remains in print is Kimmel’s turn-of-the-century tale, When Mindy Saved Hannukah (Scholastic, $5.99, paperback, ages 4-8). I haven’t seen it, but you can find reviews on Amazon www.amazon.com that give a good sense of its story. Kimmel’s holiday offering for older children is A Hanukkah Treasury (Holt, $20, ages 9-12), illustrated by Emily Lister, a collection of songs, poems, recipes and more. I haven’t seen this one, either, but admired his book about Passover, Wonders and Miracles: A Passover Companion Scholastic, $18.95, ages 9-12) www.oneminutebookreviews.wordpress.com/2007/03/24/. That beautifully produced anthology, though recommended by its publisher for school-age children, had some material that would appeal to preschoolers, too. If you can’t find these books, ask a bookseller or children’s librarian to show you other books by its author, about Hannukah or another subject. Kimmel has been writing for decades and enjoys a well-earned popularity. While the appeal of many Hannukah books won’t outlast the holiday, Kimmel’s stories are seasonless. Reviews new or classic children’s books appear every Saturday on One-Minute Book Reivews. You can read other reviews of children’s books by clicking on the “Children’s Books” category below the “Top Posts” list at right. Janice Harayda is an award-winning critic who spent 11 years as the book editor of a large daily newspaper.